“wildflower rich grassland that has not been affected by modern farming methods. The grassland has not been ‘improved’ with fertilizer or herbicides or reseeded to produce more grass for agriculture. It is found on shallow, free draining and alkaline soils”. SSSIs are protected by law to conserve their wildlife and/or geology and as such an approved management regime is required to maintain and, if necessary, improve the important characteristics of the site. One of the best ways to manage grassland for conservation purposes is to use livestock grazing. Livestock grazing plays a key role in maintaining species-rich habitats by controlling more aggressive species, which would otherwise dominate these areas, and by preventing scrub encroachment. Livestock grazing removes plant material more gradually than cutting or burning and gives mobile species a better chance to move to other areas within the habitat. The main area of grassland on the site is Charlton Kings Common and livestock grazing by Dexter cattle was introduced here in 2004. 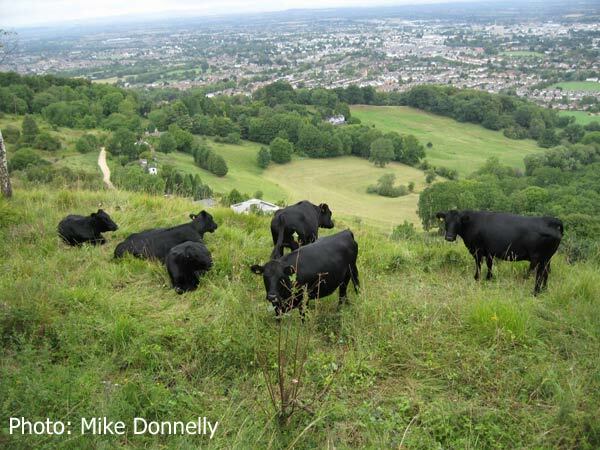 According to The Dexter Cattle Society “The Dexter breed originated in the South West of Ireland. The smallest native breed of cattle in the British Isles, they are hardy, dual-purpose cattle, producing excellent beef and milk, an ideal suckler cow for conservation grazing”. Being hardy animals they are able to live outside throughout the year and, having short legs, they are able to cope with the steep slopes found on the site. Cattle use their tongues to pull tufts of vegetation into the mouth. This means that they do not graze vegetation too close to the ground and often leave tussocks of grass which are used by insects and small mammals. Because of their wide mouths cattle do not graze selectively and as a result do not target flower heads and herbage which is important for botanically diverse habitats. Cattle are able to create their own access into rough areas and the trampling of these areas can be an important way of controlling scrub. From 2004 to 2011 grazing was performed using a temporary paddock system whereby the cattle were retained in small sections of the site by temporary electric fencing. This was a very labour intensive systems, using up a lot of FOLK work party time, as the paddocks needed to be moved to a new area every few weeks. In 2011, following the re-instatement of the Cotswold stone wall along the southern edge of the Common, and the fencing of the remaining perimeter, an extensive grazing regime was started (and will continue into the future). This regime allows the cattle to range freely across this large enclosed area. As they graze across the landscape, the cattle decide for themselves where to concentrate their efforts and they create a mosaic of different sward lengths and micro habitats. The grazing animals eat selectively and often choose the more dominant plant species, which allows less competitive plants to become established and increases species diversity. The herd of Dexters is managed by a local private grazier under contract to Cheltenham Borough Council. Their aim is to try to keep the cattle on the site throughout the year but, as the amount of plant growth and hence the amount of suitable food for the cattle varies from year to year as well as from season to season, it is sometimes necessary to either reduce the numbers on the site or to remove the herd altogether. There are a number of fields adjacent to the site that can be used for this purpose. Cattle are also taken off the Common, and kept away from visitors, when they are about to calve and for a period afterwards, and also when they are put with the bull. In 2015 the herd won first place in the Small Herd Category of the Midland Dexter Group Herd Competition (see the article on page 6 of FOLK Newsletter Issue 50 Spring 2016 for more information). Note: As the cattle are free to roam on the Common, visitors to the site will see them regularly and sometimes at close quarters. The Dexters are a placid breed, are used to visitors, and will usually just ignore people and get on with their own business. However, visitors are asked to respect their space, and particularly to control dogs in their vicinity. Visitors to the site should also ensure that gates are kept closed at all times so as to prevent the cattle from escaping. Should you need to contact the grazier, e.g. to report an issue or problem, please phone 01242 522767.